Tawny Owls are our most frequently heard/seen owl in and around gardens, but despite our familiarity with these birds, we know little about the impacts of urbanisation on their behaviour, and how it influences our ability to detect their presence. Tawny Owls are reliant on vocalisations, using them to show ownership of a breeding territory, as well as attracting a mate and reinforcing a pair bond. Tawny Owls can make a variety of calls but the most familiar are their "kee-wick" and "hoot" sounds. The hooting or “twoo” sound is usually made by the male and is a territorial call. You can sometimes hear a female responding to a male’s “twoo” call with a sharp “kee-wick”. Together this duet produces the classic “twit twoo” sound, which many people associate with these owls. You can listen to these calls here. The 2018/19 survey ends on Saturday the 30th of March 2019. Our Tawny Owl survey builds on information collected by 3,465 volunteers in 2005/06, who listened for Tawny Owls in their gardens. It helped us to learn factors which affect calling behaviour. 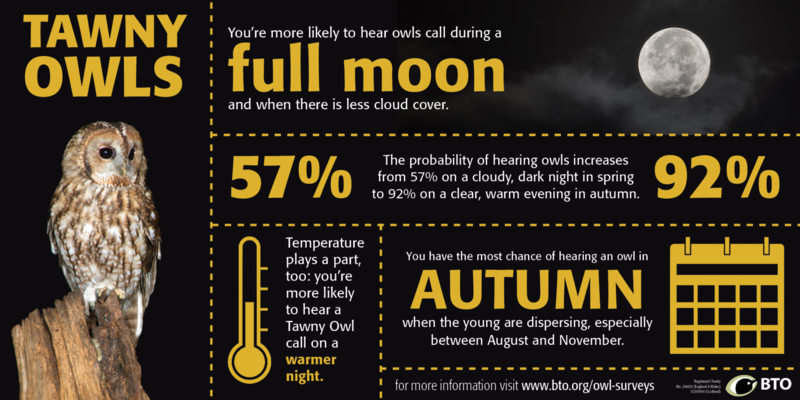 We know that the time of day, the moon cycle, weather and distance to woodland impact chances of hearing a Tawny Owl. We want to take this a step further and explore the impact of artificial light pollution and other aspects of urbanisation on the likelihood of hearing Tawny Owls. At the same time, we’ll also look at seasonal changes in Tawny Owl calling behaviour more generally and see if urbanisation plays a role in this too.